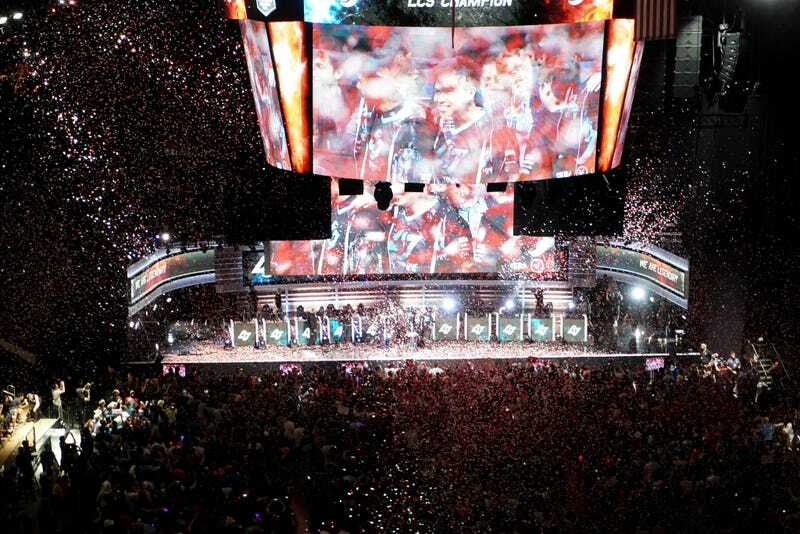 The North American League of Legends Championship Finals (NA LCS) that went down this past weekend at Madison Square Garden was a mostly epic affair. There was one major exception: the actual finals match that took place on Sunday night. Playing in the standard best of 5 playoff format, Counter-Logic Gaming (CLG) dominated its first three games against Team SoloMid (TSM), making the weekend’s deciding match a far more efficient affair than the EU LCS finals that immediately preceded it, and even the competition for third place that occurred the day before at Madison Square Garden. Watching the games from the arena, fan disappointment with how quickly and cleanly CLG stomped their opponents into the ground was palpable. As I walked out of the stadium after the final match, I overheard two young men—both wearing large plush hats for different League of Legends champions—ranting about how anticlimactic the game was. “I feel like I have blue balls for a better matchup!” One of them sighed. The other chuckled. He wasn’t incorrect in his assessment. If you look back at the beginning of each match, TSM was all but destined to lose the games last night. WildTurtle is TSM’s “attack damage carry,” or ADC. This is a specific position in League of Legends that normally plays on the bottom lane of the game’s map and spends the early portion of a match farming enemy minion and champion kills with the help of a support ally. They do this to level up quickly so by mid and late-game the ADC can stand around the outskirts of team fights, hammering away at enemy champions with as much attack damage as possible. Kog’Maw is perfectly adept as an ADC champion. The problem was that TSM didn’t do much of anything to build around him. His most powerful assets are his very long-ranged barfing attacks, of which he has several. The bug’s main weakness, meanwhile, is that he has no easy way to escape if someone gets in close enough to start dealing damage. This which means that an ideal team comp would help support Kog by keeping enemies at a safe distance. TSM went with WildTurtle on Kog’Maw in all three games last night. Each time, they failed to select enough corresponding champions that would help protect him so that he could maximize his barf damage potential. That meant that even when Kog’Maw actually started doing serious damage, he didn’t end up surviving long enough to have a great enough impact on the match at hand. Nautilus, the giant anchor-wielding dude who looks sort of like a Big Daddy from BioShock, manages to knock up three people on CLG early in this clip. Turtle, who’s playing as Kog’Maw, even scores three kills in the follow up. But none of this is enough to stop DoubleLift and his surviving support teammate from taking out their entire team. Why was DoubeLift able to stay alive while the rest of his team was dying, and clean up so thoroughly? He’s a great ADC, that’s obviously part of it. But this is precisely the kind of play whose outcome was determined by the strength of CLG’s team comp, and the relative weakness of TSM’s. Especially compared to someone like Kog’Maw, Jinx has a lot of escape options as an ADC. Her passive ability “Get Excited!” gives her a huge movement speed boost whenever she kills an enemy, meaning that Doublelift had a ton of mobility throughout this fight. And then there was the way his support ally was helping him dole out tons of damage. Watch the gameplay clip above again. See how Jinx, who’s at the bottom of the screen, turns bright gold around the 26-second mark? She changes colors because Janna, the support champ she’s playing with, spent the earlier portion of the game building towards an item called “Zeke’s Harbinger.” This item is devastatingly powerful in situations like this one because it gives a humongous boost to a target teammate’s critical hit chance and an additional bump for their ability power. Combined with all of Jinx’s existing assets, this meant that Doublelift basically had an open invitation to wreak havoc on the enemy team. One could certainly argue that the real problem here is Zeke’s Harbinger being an overpowered item. Without it, I doubt that Doublelift would’ve landed a pentakill—let alone survived for so long. But at the same time, the powerhouse move makes me wonder why TSM couldn’t have build out something similar for its team composition. Simply put, Zeke’s Harbinger wouldn’t have been as effective for Alistar, the TSM support champion in this game, since he needs to pick items that beef up his innate tankiness. And since Kog’Maw’s barfing attacks are his strongest ones, an item that boosts his ability power (AP) was also preferable. He’s also one of the most powerful picks for League’s current meta, so Pobelter picking him and then cleaning house with him made perfect sense. What made a lot less sense was TSM doing nothing in the second two games to deal with him—say, by banning Viktor during the standard pick-and-ban phase. Instead, they continued to ban Kalista, an ADC champ, at the start of every match. Doublelift clearly didn’t have any problems adjusting to this ban. This came after CLG’s top-laner, ZionSpartan, played Yasuo to great effect in the first game—a choice he likely made to counter TSM’s Gnar pick for top lane. TSM might have gone with the Yasuo picks to try and deny him from ZionSpartan, then. But the problem was 1) Bjergsen just didn’t end up doing that much damage with him, and 2) Yasuo isn’t super strong in the current meta anyways. TSM’s loss was so resounding that some LCS fans have been wondering if they were even trying to win last night. It’s a better story if CLG wins, after all—the team was losing so badly last year that were almost dropped from the LCS entirely, after all, making their comeback over the course of the 2015 LCS uniquely dramatic. Regardless of CLG’s impressive wins, a lot of League eSports fans are putting pressure on TSM’s coaches now for how they handled the draft phase last night. CORRECTION: This article originally said that both CLG and TSM had made it into the League of Legends World Championships prior to the finals game on Sunday. CLG had not yet made it in, which makes their win even more of a triumph for the team. I sincerely apologize for the error.